Diese Webseite wurde einmillionenfünfhundertneunundachtzigtausendfünfhundertfünfundneunzig mal aufgerufen. Es sind gerade neunundzwanzig Besucher auf der Seite. 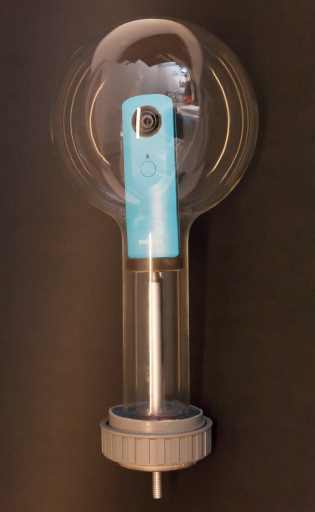 A first version of the underwater case for Ricoh Theta and Ricoh Theta M15 is ready for use. The camera is released by the WiFi connection to Android or iOS app. Because of the strong absorption of water for radio waves the trigger distance is limited to a maximum of 30 cm, provides best environmental conditions. A second version with pneumatic or electrical release mechanic is under development.